In 2009, as so often happens these days, a new recreational drug swept the British market. Mephedrone (also known as Meow Meow) was easily purchased online, and reportedly had effects similar to a combination of cocaine and ecstasy (MDMA), but without the comedown/hangover associated with either. With military precision the bizarre alliance of social conservatives (who fear drugs for no coherent reason) and the alcohol industry (which more legitimately fears damage to its revenues) kicked its usual anti-drugs stories into action to create a moral panic. The anti-drugs campaign rolled out in full-force in the media, using a carbon-copy strategy to that which had labelled Ecstasy “dangerous”. In 1995, a teenager called Leah Betts died after taking Ecstasy. Although it emerged that Leah had actually died from water intoxication, the lie campaign had done its work well. This time, the deaths of two young men were used to justify a knee-jerk reaction from both the ruling Labour Party as well as the opposition Conservatives, both vying to be toughest on the new “killer drug”. It later emerged that the two men weren’t killed by mephedrone (in fact they hadn’t even taken it), but again the bandwagon was now rolling, and the drug was banned in April 2010. As ever in these cases, the Home Secretary Alan Johnson ignored the advice from drugs and medical experts against the ban, a decision which led to the resignation of a scientist from the Advisor Council on the Misuse of Drugs (ACMD). 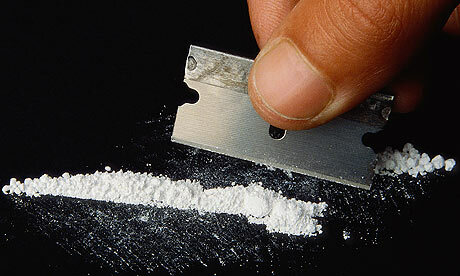 Those who were using mephedrone legally at the time reported that it was a perfect substitute for cocaine; not only was it far cheaper (at no more than £10 per gram compared to a typical £50 for coke), but it was a more pleasant experience, and it seemed to lack the comedown associated with coke. Most importantly, being laboratory-manufactured and legal, the drug supply could be guaranteed clean and pure. Cocaine on the other hand, is an expensive product imported from Latin America, requiring bribes to be paid all the way down the supply chain. Coke dealers therefore keep street prices low and maximise their profits by cutting the product with a variety of other ingredients, from caffeine (which has a superficially similar effect to coke) to the anaesthetic lidocaine. In short, mephedrone users could be far more sure of what they were buying than cocaine users. The anecdotes of people switching from cocaine to mephedrone seemed to be confirmed by statistics published this year; one study showed that fewer soldiers had tested positive for cocaine while mephedrone was legal; another that UK cocaine deaths fell during the time mephedrone was legal. As ever, the authorities had taken the most moronic possible approach to dealing with a drug, and the results showed it. The net effect of banning mephedrone was to push people back to the cocaine trade, an industry that was no doubt as grateful for the government help as it is for the lack of any regulation or taxation. Coke dealers get to blend and sell their product without any of the controls that are applied to legal drugs, from alcohol to aspirin. The so-called war on drugs is among the most moronic acts mankind has ever perpetrated against itself. The immense cost, destruction and death toll it has spread around the world dwarf most of the worst excesses of humanity. Our smarter leaders know this, but are intimidated into silence by the war and alcohol industries, which profit to a huge degree. It’s time to end it – if you’re a UK citizen, please sign this e-petition to decriminalise drugs. With enough signatures, a parliamentary debate can be triggered. US readers are invited to see how many of your tax dollars are being wasted on this moronic war. i'm not anti drugs at all, but mephedrone is a research chemical that is relatively new, i.e. we have no old users still alive. we do however have old people who have used cocaine as it's been around for a very long time. mephedrone is horribly moreish – with reports of people taking up to 5 grams a night as it's cheap,and addictive. people were then later reported as having their limbs go funny colours due to the mephedrone. people dealing meph would also be able to cut it with aspirin or whatever in the same way coke is cut. i haven't got this information from any sort of tabloids, but from reports of people taking meph and documenting it online on sites that are essentially pro-drugs. oh here you go: and these are people that actively enjoy taking drugs. While I'm broadly in favour of drug decriminisation, mephedrone operated in a legal vacuum and was not subject to any of the controls that legal drugs were. There was nothing at all to stop sellers of mephedrone cutting their supply with other drugs or chemicals, as they were explicity sold "not for human consumption". 1) Do some proper research on the health effects (both bad and good) so users actually know what they're taking. It's insane that the government doesn't already do this. 2) Regulate the manufacture and supply; it should probably be provided through pharmacies to over-18s only. 3) Tax it – mephedrone is too cheap. A tax of perhaps £20 a gram would push retail price to £30-ish which would be a more sensible price. And would bring some much-needed revenue to the government. I think I saw a report on the BBC suggesting that marijuana retards brain development in teenagers, which they suggested was another reason to keep it illegal (this is obviously illogical, but does suggest that a licensing system similar to the current one for alcohol might be appropriate). Equally illogical is the fact that some recreational drugs (alcohol, nicotine, etc) are perfectly legal, whereas others (often less dangerous) are not. The government gets a lot of fiscal benefit (lower policing, excise and jail costs), as well as extra tax revenue. The police would have less need/excuse (delete as preferred) to use “stop and search”, hopefully (over time) improving community relations. Wherever there are winners, there are usually losers. Decriminalising drugs would lead to a requirement for fewer police, prison officers and prison spaces. There are people who wouldn’t want that to happen (G4S, for example).